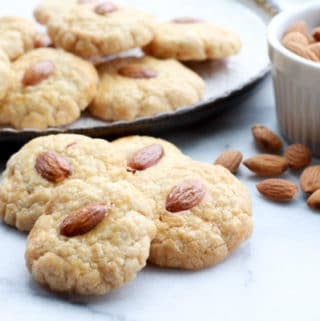 Last Updated: April 15, 2019 · Published: February 4, 2019 By: Asian Caucasian 12 Comments This post may contain affiliate links or sponsored content. Did you know that “red” is the predominant color during the Chinese New Year? Going with the red theme, here’s another colorful dish to celebrate the “Year of the Pig,” which begins on February 5th. It’s my take on this classic Chinese sweet and sour recipe, but with a healthier twist. 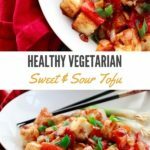 This Healthy Vegetarian Sweet and Sour Tofu will rock your world! The sweet part is the honey, but only 2 teaspoons! And the apple cider vinegar balances out the sweet. I only used 2 tablespoons of canola oil to brown the tofu, so no deep frying! The tofu is coated with corn starch so they are nice and crispy to the bite. 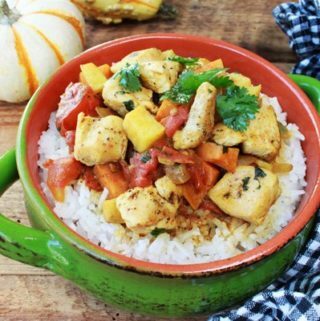 The classic sweet and sour dish has chicken, beef, or pork. You could use whatever protein you have on hand, but I’m keeping it vegetarian this time with the tofu. Now, let’s talk peppers. I am not fond of green bell peppers, which is traditionally used in this dish. So I simply substituted the green peppers for red and yellow bell peppers, which are also much sweeter. These peppers truly brighten up this dish, gives it that pop of red, just like the Chinese New Year! “Guo Nian Hao” 新年快乐, as they say in China! 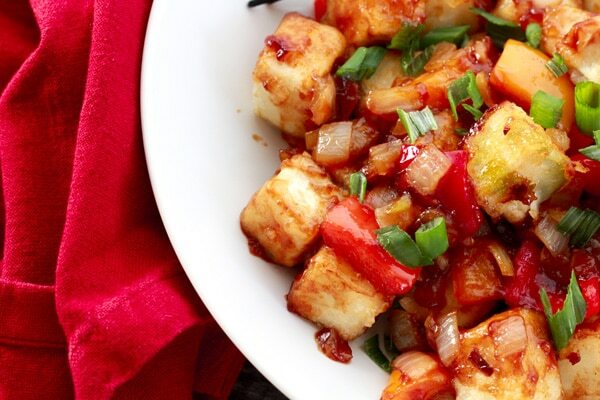 Cubed tofu is the star in this colorful dish. Make sure to get the moisture out of the tofu before tossing it in the cornstarch. You’ll want to drain the tofu as much as possible, tightly wrapping it in paper towels or a kitchen towel to remove excess liquid. Let sit for at least 30 minutes. 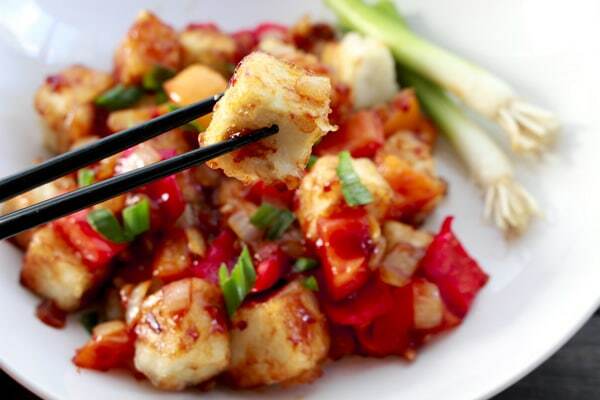 Cut the tofu into one-inch cubes. Then lightly toss the tofu cubes into the cornstarch to coat all sides. Brown the tofu cubes on all sides in a heavy skillet, about 3 to 4 minutes, until crispy. 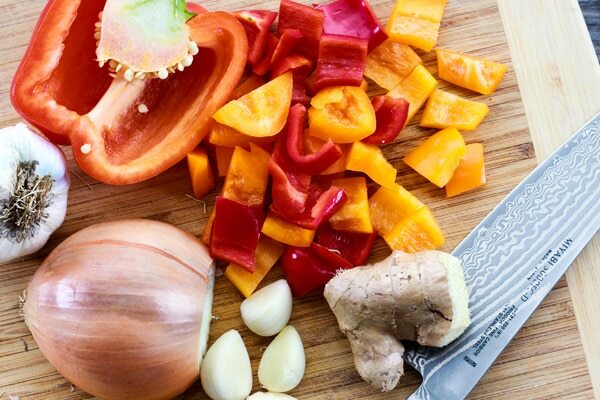 Sauté the minced garlic, onions, and bell peppers until fragrant and onions are translucent. Whisk together the soy sauce, apple cider vinegar, ketchup, honey, ginger, and red pepper flakes. In a separate small bowl, whisk together the corn starch with 2 tablespoons water. Add the sauce mixture to a small saucepan on the stove at medium heat. Add the in the cornstarch mixture and keep stirring until the sauce thickens, about 30 seconds. Immediately remove from the heat. 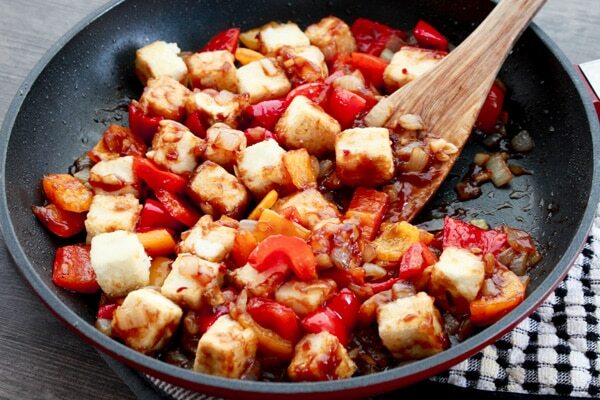 Pour the sauce over the veggies and add in the cubed tofu, stirring to thoroughly coat with the sauce. 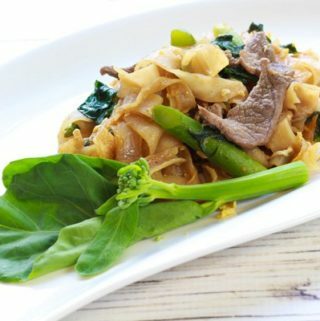 Garnish with chopped green onions, and serve with a side of steamed brown rice if desired. Look at these vibrant veggies! I substituted green bell peppers for red and yellow peppers. They are sweeter and more colorful! Toss everything together with the sauce. Then garnish with chopped green onions. Fun Fact: No sweeping on Chinese New Year’s Day! This is an interesting fact about Chinese New Year – all the sweeping and cleaning have to be finished before the New Year’s Eve and it is not allowed to sweep on the New Year’s Day. According to the old saying, if you sweep on that day, it means you just sweep wealth and good fortune out of the house. In different areas of China, the custom is a little different. In some places, people will not sweep until the fourth day of the New Year for keeping good fortune in house. Make sure to get all of the moisture out of the tofu before you cube it. The tofu will fry up much better this way. I wrap the tofu in kitchen towels and put something heavy on top of it. Let it sit for about 30 minutes. Use the firmest tofu you can buy. I use sprouted tofu from Trader Joe’s because it holds up so well. 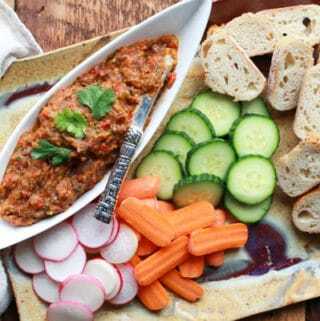 I’ve made this vegetarian, but add a meat protein with this sauce and it’s amazing too! WANT MORE? If you like this recipe, you’re going to love my Chinese Eggplant with Garlic Sauce. 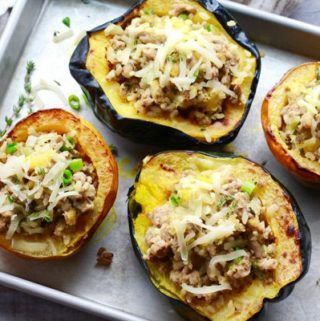 Beautifully charred Chinese eggplant is topped with a flavorful garlic sauce with minced turkey sausage and a bit of heat! 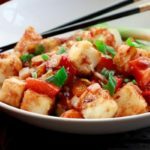 A healthier version of this classic Chinese dish, Vegetarian Sweet and Sour Tofu is the perfect balance of heat, sweet, and acid! Drain the tofu block and tightly wrap with paper towels or a kitchen towel to remove excess liquid. Let sit for at least 30 minutes. 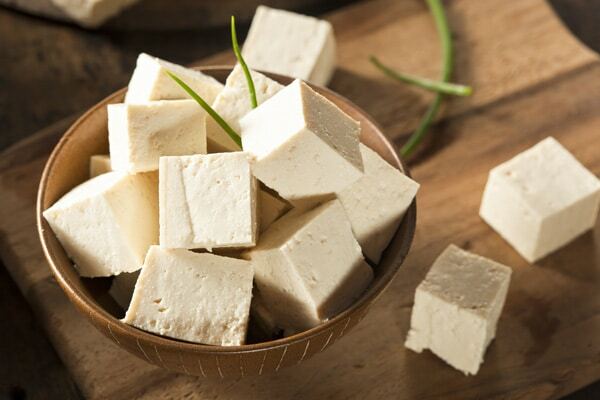 Place on a cutting board and cut the tofu into one-inch cubes. Place the cornstarch into a shallow dish (like a pie pan). 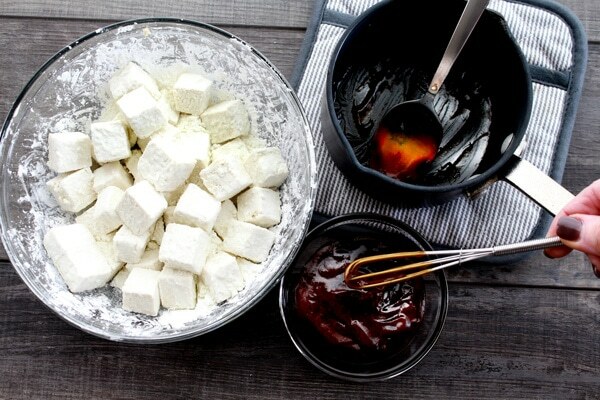 Lightly toss the tofu cubes into the cornstarch to coat all sides. Heat a heavy skillet on medium high heat using 2 tablespoons of the canola oil. Add the tofu cubes and brown the tofu on all sides, about 3 to 4 minutes, until crispy. Remove the tofu from the pan and set aside. In the same pan, add the remaining one tablespoon of canola oil and heat on medium-high. Add the minced garlic, onions, and bell peppers. Sauté until fragrant and onions are translucent. Remove the pan from the heat. In a small mixing bowl, whisk together the soy sauce, apple cider vinegar, ketchup, honey, ginger, and red pepper flakes. In a separate small bowl, whisk together the corn starch with 2 tablespoons water. 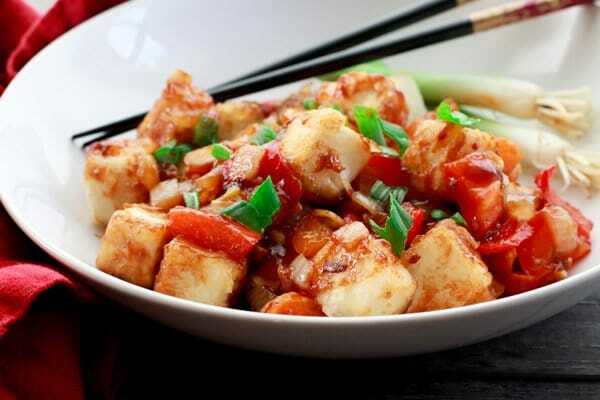 To serve: Pour the sauce over the veggies and add in the cubed tofu, stirring to thoroughly coat with the sauce. 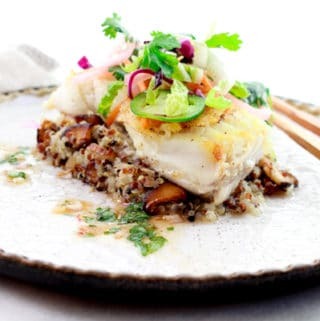 Garnish with chopped green onions, and serve with a side of steamed brown rice if desired. Looks delicious and full of the flavors I love! I don’t cook much with tofu but seeing your recipe I think I should. 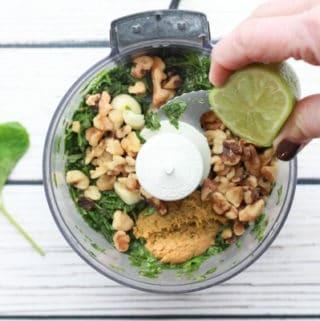 Can’t wait to try your recipe! 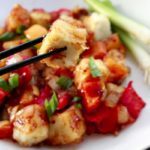 Crispy tofu is the only kind of tofu that I like and this sounds delicious! 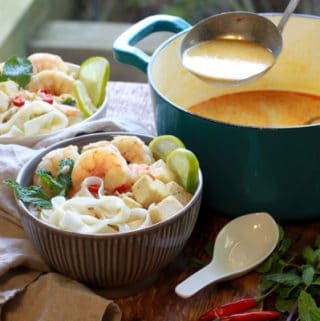 A great recipe to celebrate Chinese new year or just a lovely meal for any time of year. I love to use corn starch for the tofu because they crisp up so nice and golden brown every time. Can’t wait for you to try this one! Your dishes look incredibly vibrant and look soo yummy. 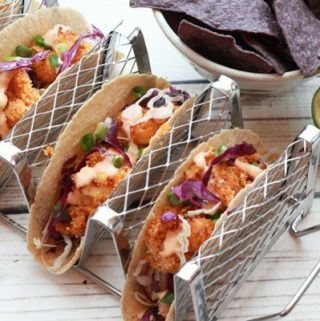 Another great recipe that I must make as soon as. Delicious. Thank you so much, Ramona! Hope you love it too! I love the flavors in sweet and sour! I can’t wait to try this! The tofu looks so crispy on the outside! Yum! I just love crispy tofu, and it’s so easy with the cornstarch. I don’t deep fry any of my food but it’s still very golden brown. Can’t wait for you to try this! Yum! I can’t wait to try this. That sauce sounds so delicious! Thanks, Amanda! The sauce is killer, and the tofu says nice and crispy in the sauce. Glad you like it! Thank you so much, Suzy! I hope you will enjoy this dish as much as I did. My family loves tofu so that’s a start! Happy CNY! This is such a beautiful dish! Love that it’s made with tofu. Happy Chinese New Year!